"Now, son of man, take a block of clay, put it in front of you and draw the city of Jerusalem on it. Then lay siege to it: Erect siege works against it, build a ramp up to it, set up camps against it and put battering rams around it. Then take an iron pan, place it as an iron wall between you and the city and turn your face toward it. It will be under siege, and you shall besiege it. This will be a sign to the people of Israel." Ezekiel 4 is part of a series prophecies that include inspired speech, symbolism and drama used by Ezekiel in chapters 4-24. In chapter 4-7 Ezekiel dramatized the siege of Jerusalem for the Jews in exile in Babylon to observe. Beginning on the day of his calling Ezekiel was to be mute and unable to speak accept when the Lord opened Ezekiel’s mouth to prophesy (Ezekiel 3:26-27). This state of prophetic muteness would continue until the city of Jerusalem had fallen (August 586 BC) and a man arrived at Ezekiel’s home from Jerusalem announcing Jerusalem had fallen (on Jan 8, 585 BC five months after it fell). Ezekiel will be mute for seven and a half years (July 593 – January 585 BC). It appears the demonstration of chapter 4 occurs outside Ezekiel’s front door. The Jews had observed (Ez. 3:15-16) Ezekiel’s seven days of confinement after his initiation vision, so now they wonder what he is doing in his front yard. Ezekiel takes a clay brick and etched a diagram of Jerusalem on it, an image that all the observing Jews would be familiar with since they had lived and worked in Jerusalem up until 5 years before. Next, Ezekiel made little siege works with battering rams like little scale models of Babylonian military equipment. He then added some ramps to roll the siege engines up to the city walls that were etched on his clay brick. Ezekiel then added around the model of Jerusalem the military camps of the Babylonian soldiers. Then with the diagram of Jerusalem surrounded by Babylonian camps and several siege engines ready to begin pounding on the walls of Jerusalem with their battering rams Ezekiel is to deliver the most startling point of his drama. Ezekiel, the prophet who is speaking for the Lord, is to take an iron pan and place it between his face and the model of Babylon’s siege of Jerusalem. The scale model drama and the iron pan have a meaning and we are told, “This will be a sign to the people of Israel,” but we are not told what they are to understand by Ezekiel’s demonstration. It appears that the iron pan is symbolic of the fact often repeated by Jeremiah and others that the Lord is going to hide his face and be inattentive to Israel’s suffering during the Babylonian siege. There is no hope. There is no prayer. There is no deliverance. It is interesting that the iron pan is called an iron wall. Walls were designed to protect from invasion, but this iron wall was put up to prevent the Lord from intervening in order to help protect. There are other ways of interpreting Ezekiel’s model of the siege, but the view above does agree with other prophecies and the historical results of Babylon’s invasion of Judah. Apologeomai (Gr) – excuse (Eng) – the Greek word apologeomai means literally “to speak oneself off.” Apologeomai refers to pleading for yourself as in 2 Corinthians 12:19. In Romans 2:15 apologeomai is used for excusing others. I will speak positively today and focus on the goodness of God and his works. Today I will refrain from complaining, but will instead let joy lead my words. 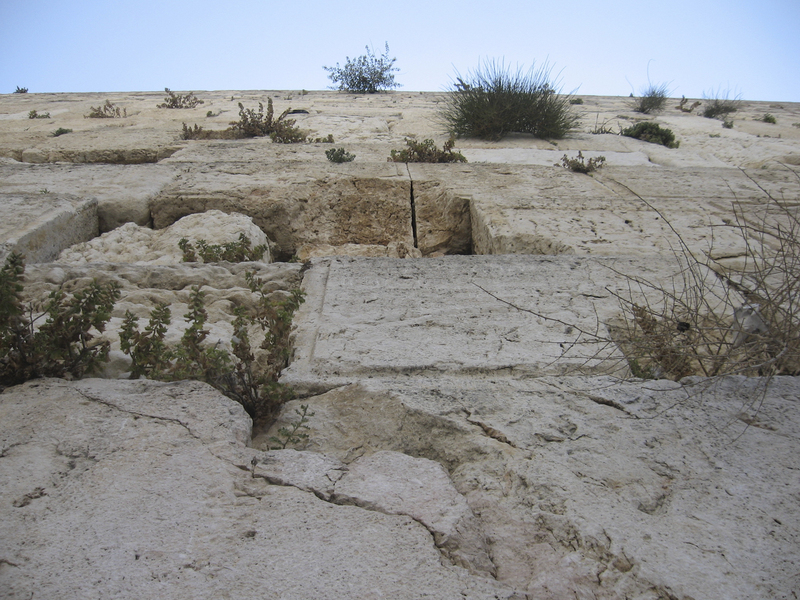 Looking up the Western Wall at some of the original Herodian ashlar stones that have held their place since around 19 BC. A chart showing the three Jewish returns from Babylon in 537, 458 and 445 BC with Zerubbable, Ezra and Nehemiah. Pieces of pottery excavated at Samaria are inscribed with names that are similar to biblical names such as Ahinoam, Gomer, Ahaz, Sheba and Nimshi. of his ways will die." 2 Jehoahaz was twenty-three years old when he became king, and he reigned in Jerusalem three months. 3 The king of Egypt dethroned him in Jerusalem and imposed on Judah a levy of a hundred talents of silver and a talent of gold. 4 The king of Egypt made Eliakim, a brother of Jehoahaz, king over Judah and Jerusalem and changed Eliakim’s name to Jehoiakim. But Necho took Eliakim’s brother Jehoahaz and carried him off to Egypt. 5 Jehoiakim was twenty-five years old when he became king, and he reigned in Jerusalem eleven years. He did evil in the eyes of the Lord his God. 6 Nebuchadnezzar king of Babylon attacked him and bound him with bronze shackles to take him to Babylon. 7 Nebuchadnezzar also took to Babylon articles from the temple of the Lord and put them in his temple there. 9 Jehoiachin was eighteen years old when he became king, and he reigned in Jerusalem three months and ten days. He did evil in the eyes of the Lord. 10 In the spring, King Nebuchadnezzar sent for him and brought him to Babylon, together with articles of value from the temple of the Lord, and he made Jehoiachin’s uncle, Zedekiah, king over Judah and Jerusalem. 15 The Lord, the God of their ancestors, sent word to them through his messengers again and again, because he had pity on his people and on his dwelling place. 16 But they mocked God’s messengers, despised his words and scoffed at his prophets until the wrath of the Lord was aroused against his people and there was no remedy. 17 He brought up against them the king of the Babylonians, who killed their young men with the sword in the sanctuary, and did not spare young men or young women, the elderly or the infirm. God gave them all into the hands of Nebuchadnezzar. 18 He carried to Babylon all the articles from the temple of God, both large and small, and the treasures of the Lord’s temple and the treasures of the king and his officials. 19 They set fire to God’s temple and broke down the wall of Jerusalem; they burned all the palaces and destroyed everything of value there.